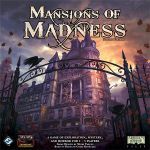 Mansions of Madness Second Edition is much, much better than the first (inferior) edition of the game. It's a fully cooperative, app-driven miniature board game of horror and mystery for one to five players! It's the English language version of the game, I got it off MightyApe a year or so ago and have only played it a couple of times, so all the pieces should be there. Now it just sits in the office wanting someone to give it the love it deserves! Are you that person?